Will There Be A Not Going Out Of Business Rally? Instead of helping to stabilize the market, the FOMC kicked out the already-wobbly legs of investor confidence on Wednesday as the selling got even heavier. Once again, President Trump's 'Keystone Cops' economic team did not help, again coming out with contradictory comments on Friday. As detailed in this MarketWatch article there were more developments after the market close on Friday. The rumors that Trump had been discussing firing the Federal Reserve Chairman were later denied. The fact that both the Nasdaq 100 and Russell 2000 lost well over 8% last week was already enough to shake the confidence of the most seasoned investor. The 7.05% drop in the S&P 500 means it is now close to down 10% for the year. This actually looks pretty good when compared the 16.4% drop in the Dow Jones Transportation Average. The weekend headlines have pointed out that the stock market is on track for the worst December since 1931, when the Dow Industrials dropped just over 17% during the month. Of course, in 1931, the Dow Industrials dropped 52.6%, which followed a 33.8% decline in 1930. Both years made the 17.2% decline in 1929 look minor by comparison. 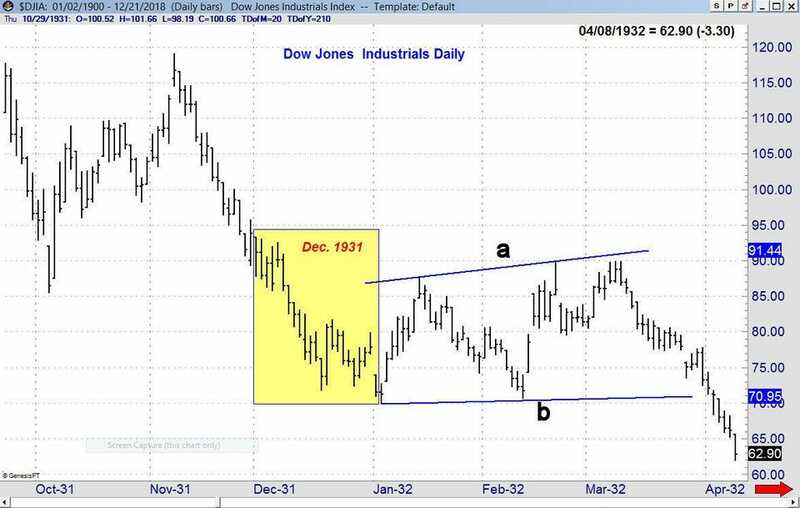 The daily chart has the December 1931 period highlighted in yellow. The Dow made its correction low of 69.85 on January 5, 1932, which was the second trading day of the year. Over the next eight days it rallied 25% to 87.78. The Dow formed a continuation pattern in January and February (lines a and b) before resuming its decline in March. During this bull market, there have been several periods of heavy selling. While most have not been as dramatic as the recent plunge, I think they can be relevant when discussing what may happen to the stock market in 2019. As of Friday’s close, the S&P 500 is down 17.8% from the September high. This is not far above the widely-watched 20% bear market level. A further decline to the 2350 area would be a decline of over 20%. While a 20% drop is often touted as a sign of a bear market, there is very little evidence for that behavior as an indicator of change in the long-term trend. The 2015 and 2016 period was the most recent period of heavy selling prior to early 2018. From the May 2015 high of 2134, the S&P 500 declined 12.5% to an August low of 1867. 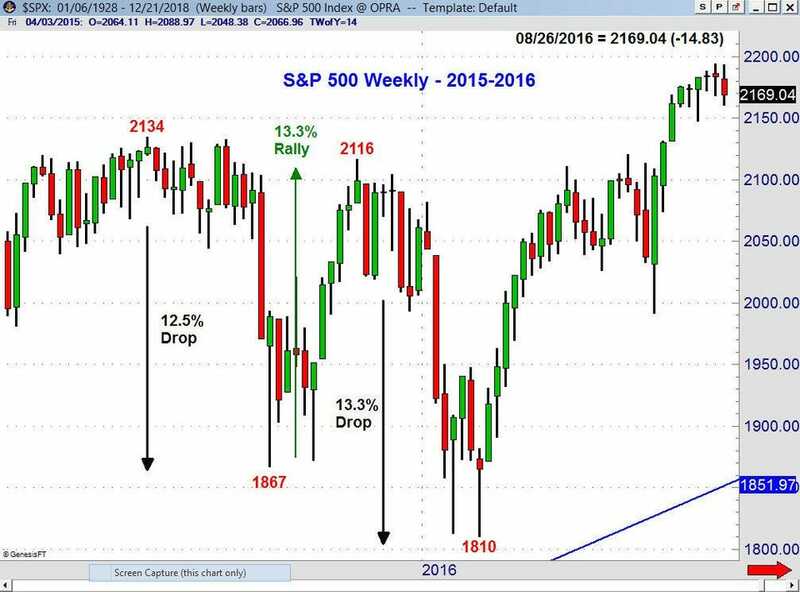 From these lows, there was a ten-week rally of 13.3% back to 2116 in early November 2015. By the time the S&P 500 made its low of 1810 in February 2016, the S&P 500 was down 13.3% from the November high.